Barrow County Airport places corporate business and general aviation travelers right in the heart of NE Georgia. One of the nations fastest growing and best places to live and work. In the foot hills of the Blue Ridge Mountains conveniently located minutes from downtown Atlanta and in the heart of the Bio Science Technology Corridor, Road Atlanta race course and University of Georgia. 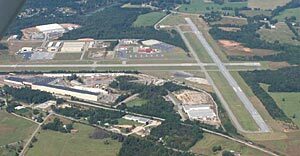 Barrow County Airport is NE Georgia’s Premier General Aviation facility just outside of Atlanta with no congestion, no ticket counters, no lines and no confusing terminal. No other airport is as fast and convenient. The airport has attracted and is attracting business to the area by offering high quality facilities such as full service FBO, two maintenance facilities, instrument landing system, AWOS, restaurant and catering (located in the terminal), hotel and conference facilities only minutes away, corporate development sites available.